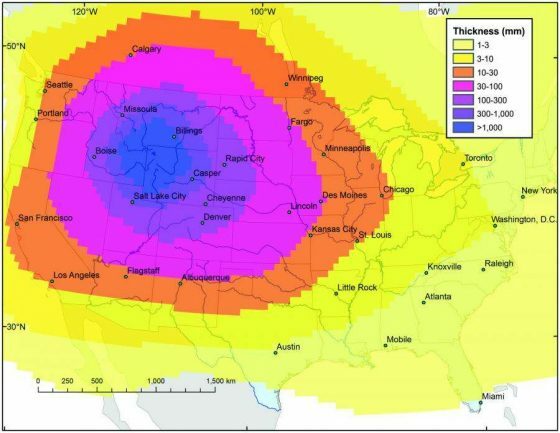 What Would Happen To The World If The Yellowstone Super Volcano Erupted Right Now? With the looming threat of a possible eruption at the Yellowstone super volcano, some preppers have wondered exactly how to prepare for such a cataclysmic event. Here is what would happen should the super volcano erupt right now. Yellowstone’s supervolcano is essentially a giant, lid-topped cauldron, and it’s so vast that it can only truly be seen from low-Earth orbit. Its crater is 45 miles (72 kilometers) across, and its underlying plumbing contains several tens of thousands of cubic kilometers of magmatic material. But if it were to erupt right now, we would have very little time to even know that it is happening. IFL Science spoke to one of the country’s most respected volcanologists to get the most up-to-date low-down on the future of the world’s most famous supervolcano. Hopefully, it will give preppers and idea of what to expect in the unprecedented event that it actually explodes. According to Yellowstone Volcano Observatory’s Scientist-In-Charge, Dr. Michael Poland, the super volcano may not have enough energy at present to produce a supereruption. “Right now, much of Yellowstone’s magma body is partially solidified, and you need a lot of magma to feed a large eruption.” The chances of a supervolcanic paroxysm are currently around one-in-730,000, which makes it less likely than a catastrophic asteroid impact. A sudden injection of new magma from beneath the caldera, or a sudden weakening of the geological layers encasing it, as unlikely as this is, may be enough to trigger a sudden depressurization event, and the entire system would violently expunge onto the surface and up into the atmosphere. What would happen next is speculative, but it may be important to understand just how dire that could be. Shortly before the hypothetical eruption, the ground around Yellowstone National Park would rise upwards somewhat. Hydrothermal system, including the geysers and geothermal pools, would rapidly heat to temperatures above boiling, and they’d likely become extremely acidic – more so than usual. A swarm of earthquakes would be detected making their way towards a central point, indicating magma rising rapidly through the crust. Then, the roof rock would fail and the eruption would begin. A vast column of ash and lava would shoot upward to heights of around 25 kilometers (16 miles). Sustained by both raw explosive energy and the release of heat through cooling lava blebs and bombs, it would sustain itself for days, pumping ash into jet streams that would transport it around the stratosphere. When the eruptive column or parts of the column fail, enormous pyroclastic flows would blast their way across the park. Immediately, anyone within the park itself would perish. That’s roughly 11,000 on average (depending on the time of year). The air would heat up to 570 degrees Fahrenheit which would kill in seconds. When the pyroclastic flows and ash deposits settle and cool, they may seem harmless, but they’re not. If it rains heavily after the eruption, especially on any slopes, then these could mix with mud and turn into rapidly-moving, cement-like slurries called lahars. If you get stuck in one, there’s a good chance you’ll have a hard time making it out alive. But the most dangerous aspect would be the effect of the fallout on the globe. If you breathe in the ash fallout, it’ll lacerate your lungs and form a glassy cement. It’s also about six times denser than water, which means plenty of architecture would collapse under its weight as it accumulates on rooftops. Poland points out that “even a few tens of centimeters of wet ash could cause weak buildings to buckle.” Roads and sewer systems would clog and break down, water supplies would be contaminated, and electrical grids would short out. Millions of homes would become uninhabitable. Those in Idaho, Wyoming, and Montana would be at the highest risk for this. The amount of ash fallout could be up to ten feet in the areas near Yellowstone but will spread across the entire continental United States and large parts of Canada. A fine layer of volcanic ash would make it as far as Miami, New York, and Toronto within a few days, but it would still enough to cause vehicles to break down and water to become unpotable. Humanity will survive, especially those who are well prepared for such a disaster, but it won’t be an easy road to have to walk when the time comes. Hopefully, this quick rundown will give preppers ideas if they want to prepare for a Yellowstone eruption.